Click title for a cool video on how the internet was born. It is a good giggle, so don't bother looking for a reference to it on Snopes.com It won't be listed there and if it is, oh, well! Snopes doesn't have the goods on everything. We leave in the morning to Albuquerque for the New Mexico State Fair. 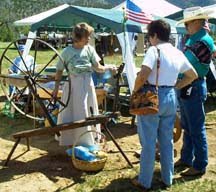 Will set up the shearing pens for the long running, nearly 40 years, Sheep to Shawl exhibit and demonstrations by the New Mexico WoolGrowers, Inc. and the Las Aranas Spinners and Weavers Guild. The fair opens on Friday with all the Junior Livestock Show people coming in. That is a good circus to sit and watch every year. 4-H and FFA members from all over the state coming to see who can show the best animals. They are all really good kids and we never have "police incidents" on our end of the fairgrounds. I have seen most of the current Advisors and Extension Agents grow up this same way, here at the Fairgrounds showing their stock. Saturday we have to get to the grounds no later than 7AM as the streets close to traffic for the big Parade. We will talk to people about sheep, wool, spinning and weaving for eighteen days. Then we will all come home and be happy without talking for a few months.